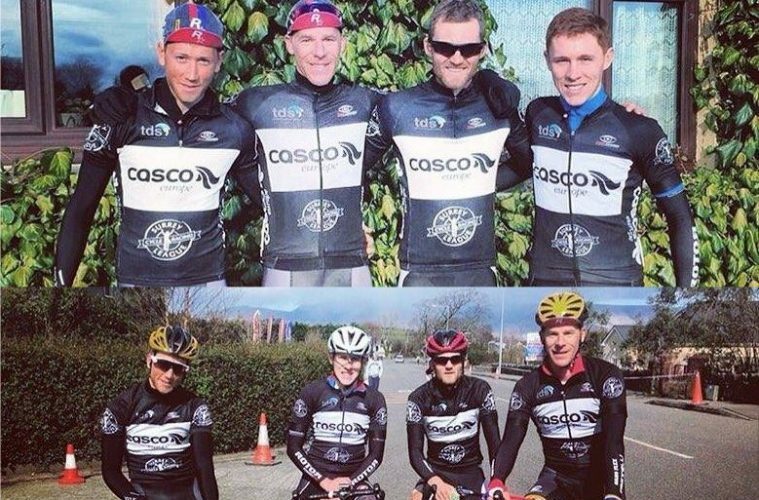 PeterHitt: This year I was lucky enough to be asked to be part of the Surrey League-Casco Europe team at the Ras Mumhan, a notoriously tough four day stage race in Ireland. I jumped at the opportunity- it would be my first race outside the UK, racing in a huge field of high class riders. There was no way I could turn it down. Our team comprised of Chris Mcnamara, Lawrence Carpenter, Jamie Lowden, Richard Cartland, and myself. We had a strong squad, and all the guys were eager to get stuck in to some proper racing after a long winter of training. Stage 1 was a 110km point to point race on the roads around Killorglin. The route profile showed a few bumps along the way, but predominantly it looked like a simple day out- hit the climbs at the front, make it into the front split, roll to the finish to fight it out for the stage win. As it turns out, that was far easier said than done. The first thing that struck me as we started racing was the sheer size of the field. Having gained most of my racing experience in a peloton of 60-80 riders, being thrown in to a bunch of 180 riders was a big shock. The fight for position in a field that size is constant, and I found quickly that to be at the front I had to be constantly moving forward, even when I thought I was well positioned. It was a far cry from the 30 second bursts from the back of the peloton to the front that I was so used to doing in the UK. We knew that the roads narrowed after 20 kilometres, and how important it would be to be in the right place as we went into the hilly part of the course. At 19.5 kilometres I was perfectly positioned- I let myself relax just for a few seconds, and suddenly I was swamped. I’d gone from fifth wheel to fiftieth in the space of a few hundred metres. As we hit the first of the ramps I was well out of position, and as the pace lifted I was constantly working my way around riders who were letting the wheels go in front of them. The Irish U23 team were attacking on the front, and behind them the race was being torn to shreds. I kept the power steady over the top of each climb, steadily moving forward up the side of a peloton that was beginning to more and more resemble a piece of string. Eventually the elastic snapped, and over the top of the final ramp a large group of riders broke clear- the whole team had made the front split, and now the proper racing was on. Things got a bit chaotic towards the end, and I chose the wrong wheel to follow. At 2km to go I realised there was no chance of me contesting the sprint: I rolled in at the back of the bunch, on the same time as the front guys. Jamie was our first rider over the line. Stage one complete! On the final day of racing I was just about getting used to racing in such a big (albeit reduced) bunch, and I settled into the front half of the peloton, doing my best to keep myself surrounded by riders and out of the wind. In fact I managed to keep my average power well below 200 Watts for the first hour of the stage, regularly sucking down energy gels and waiting for my legs to come to life. The stage was essentially split into two parts: three laps of a 25 kilometre circuit, followed by 9 laps of a 4 kilometre lap through Killorgin. Chris had warned us in advance that once we hit the town there was very little opportunity to move up, so once again the game plan was to be at the front. My legs had finally come to life, and although I wasn’t feeling strong enough to play an active part in contesting the stage, I wanted to be in a position to help my teammates in the finale. In the end we finished in the bunch- we had a little sprint for 50th place or so (Lawrence won…) while Chris and Jamie finished far further forward. Jamie’s consistency over the week had earned him a top 10 place in the General Classification, which was a fantastic achievement. Special thanks to Mark “Brown” Storie of Brown’s Bikes for looking after us and our bikes for the weekend- my Bottecchia came home in significantly better shape than when I’d first packed it into the van. Also to Richard Cartland- after succumbing to the horrendous weather on stage two, he was consistently the first one up each morning preparing porridge, coffee, croissants… Basically everything a team of hungry cyclists needs for a day of racing. Cheers, Rich! Lawrence Carpenter: Ras Munham Stage 2 The day started with sunshine and quite a still day, so we were excited to get going and see what stage 2 had to offer. We were all located far towards the front of the peloton for much of the stage, knowing that there were some narrow roads and dangerous descents to navigate throughout the stage. Climbing the cat 2 climb around halfway through the day, I knew it would be vital to be at the front of the bunch due to a dangerous decent and this proved to be even more vital as it started to pour with rain as soon as we crested the climb. Heavy rain really made the bunch very nervous and it was soon after this point that the break for the day went up the road, containing Jamie. The next 10km proved to be flat out causing fractures in the peloton but Chris and Lawrence were sitting comfortably in what was left of the bunch, with Peter closely behind. The rain continued to pour and the temperature dropped to below 5degrees causing everyone (who had dressed for a sunny day) to shiver and trying their best to stay warm. The last 20km of the race was more about survival with the break managing to stay out front, gaining some time and putting Jamie into a strong position on GC. Everyone behind was pretty pleased to have made it home in one piece and without hypothermia! Thoughts turned to recovering and helping Jamie and his GC battle as much as we could for the stages ahead of us. Ras Munham Stage 3 We woke up to a lovely morning, with sunshine but a fair bit of wind. Upon leaving and driving to the start we quickly realised that the forecast did not look good, as we got closer to the HQ the weather had completely deteriorated into hurricane force winds and bursts of the heaviest freezing cold rain and hail I have ever experienced. We were sitting in the Van thinking, surely we cannot be expected to race in this- but being in Ireland we weren’t sure what to expect. Come the race start it had cheered up a little bit with only the odd burst of rain, clearing up and proving to be a sunny, and dry for the remaining of the day. The hammer went down immediately and the race was split all over the road, with some people making it back up to the front but many being distanced right from the begging Kilometres. The course was perhaps the Queen stage, and people were shelled out the back all day, with groups all over the road. Come the 1st category climb towards the end of the stage myself and Chris were sitting in what was left of the peloton behind the break in which Jamie Lowden had got himself into. The group completely split, fracturing into many little groups over the top and flying down the descent the other side, trying to avoid coming off the road (as some did!) frantically working as hard as we could to make it into the best group to get to the finish without loosing too much time on the GC. We all ended up finishing in different groups on the road, with Jamie finishing an impressive 5th on the stage and Chris and Lawrence not far behind. This was a fantastic stage, proving to be the best I had ever raced, with a mixture of hard climbs, crosswinds and generally fantastic support.